Edits Ordinator perks to benefit Elemental Destruction Magic. Enai Siaion and reaperix can do anything with this. Cause without them this wouldn't exist. Any translations are OK, go ahead you don't need my permission. If anyone wants to make custom meshes or textures, that's fine with me. Send me a message and I'll even be willing to post them here, or at least a link. Daedras Due is out. Summon Resist is in. 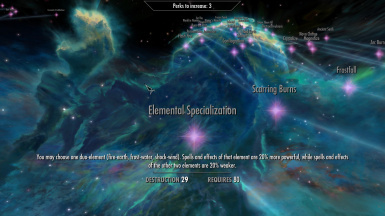 Ordinator 7.74 nerfed some Destruction perks :( I bow to Enai Siaions wisdom. Elemental Oil now works with ED. Edits Ordinator perks to boost Elemental Destrucion Magic (Perk Version) spells. Elemental Destrucion Magic (Perk Version) - reaperix has 3 versions, this is the only one with perks. LOOT works fine, or mine after theirs if you don't use LOOT. 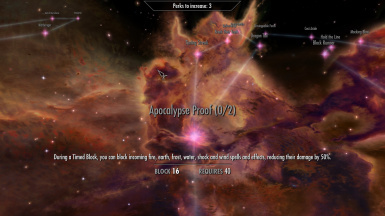 But, if you have SMO-Ordinator Patch this goes before the SMO-Ord patch. 40 - Elemental Oil - You may choose a power focused on one element. At will, create a pool of oil that lasts 20 seconds. It reacts violently when struck by a projectile or explosion, exploding and dealing damage equal to your Alchemy skill level. 60 - Alchemist's Cookbook - You may choose a second Elemental Oil power. In addition, you may also choose "Calming Oil", "Frenzy Oil", "Paralysis Oil" or "Hallowed Oil". 80 - Trick Arrows - Able to upgrade many types of arrows at a forge or anvil, adding a bonus effect (Force, Immolation, Crushing, Freezing, Breakers, Grounding, Supersonic, Maze or Death) based on its material. 40 - Apocalypse Proof (2) - Perform a Timed Block to mitigate incoming elemental spells and effects, reducing their damage by 50%/to zero. 50 - Skeleton Mages (2) - Able to create Skeleton Mages (Fire, Earth, Frost, Water, Shock, Wind/, Poison, Drain Armor, Stagger) at a Bone Altar. /You may choose their element at the time of creation. 80 - Unleash Hell - Conjured Daedra within 75 feet gain additional spells on a 30 second cooldown (Flame Atronach: fire explosion. Earth Atrnach: reduced armor/magic resistance curse. Frost Atronach: reduced armor/magic resistance curse. Water Atronach: water explosion. Storm Atronach: magnetic knockdown. Wind Atronach: kinetic knockdown. 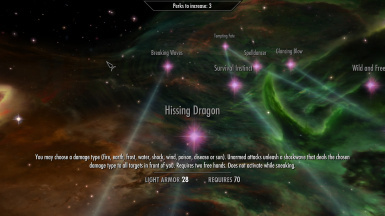 Dremora: increased attack damage and movement speed). 20 - Combustion (2) - Fire and earth spells and effects cast on others are up to 30/50% more powerful, based on the target's missing Health percentage. 20 - Ionized Path (2) - Shock and water spells and effects cast on others are up to 30/50% more powerful, based on the target's missing Magicka percentage. 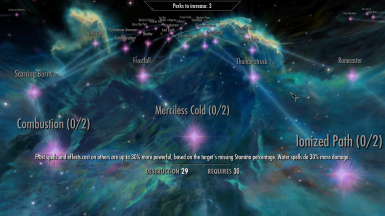 20 - Merciless Cold (2) - Frost and wind spells and effects cast on others are up to 30/50% more powerful, based on the target's missing Stamina percentage. 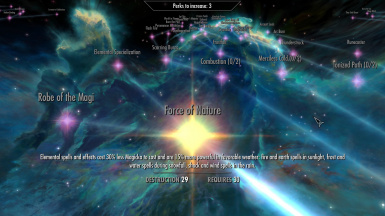 30 - Force of Nature - Elemental spells and effects cost 30% less Magicka to cast in favorable weather: fire and earth spells in sunlight, frost and water spells during snowfall, shock and wind spells in the rain. 30 - Frostfall - Frost spells reduce the attack damage of their targets by 25% for 5 seconds. Water damage will cause targets to start drowning if their health is low. 30 - Scarring Burns - Fire spells reduce the fire resistance of their targets by 25% for 5 seconds. Earth damage makes targets much more vulnerable to physical damage if their health is low. 30 - Static Field - Shock spells that would leave their target above 75% Health deal enough additional damage to make up the difference. Wind damage will always blow targets away if their health is low. 60 - Iced Earth - Dual casting frost spells freezes the earth under your feet. The frozen ground deals 40 points of damage per second to Health and Stamina for 4 seconds on contact. Using water creates flooded earth which cause damage and the possibity to slip. 60 - Nova Charge - Dual casting 6 shock spells in combat triggers a shock nova that deals 150 points of shock damage to nearby enemies and staggers them. This can only occur once per battle. Using wind creates a Slow Time effect. 60 - Pyromancer Ascension - Dual casting 6 fire spells in combat unleashes your power for 20 seconds: fire spells and effects are 50% more powerful and cost half Magicka, and you leave burning ground in your wake that deals 30 damage per second. Using earth creates a damaging Ash explosion. This can only occur once per battle. 70 - Ancient Seals - Destruction runes no longer deal instant damage, but inflict a stacking 10 second elemental burn that deals 20% damage per second. 70 - Electroconvulsions - Shock spells incapacitate living targets below one third Health if they are not shock resistant. Wind spells will disarm the target below one third. 70 - Hypothermia - Frost spells paralyze living targets below one third Health if they are not frost resistant, or less than half health for targets suffering from water spells. 70 - Scorched Earth - Fire spells (except concentration spells) burn corpses to cinders, creating a pyre that burns for 30 seconds. The burning ground deals 50 points of damage per second for 5 seconds on contact. Earth spells slow the target. 80 - Elemental Specialization - You may choose one two-element combo (fire-earth, frost-water, shock-wind). Spells and effects of that element are 15% more powerful, while spells and effects of the other two elements are 15% weaker. 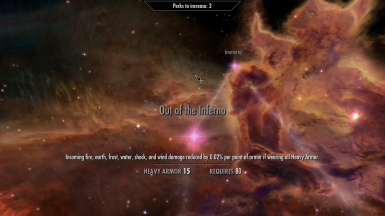 80 - Out of the Inferno - Incoming elemental damage reduced by 0.02% per point of armor if wearing all Heavy Armor. 70 - Hissing Dragon - You may choose a damage type (fire, earth, frost, water, shock, wind, poison, disease or sun). Unarmed attacks unleash a shockwave that deals the chosen damage type to all targets in front of you. Requires two free hands. Does not activate while sneaking. 80 - Spelldancer - Wardancer also improves elemental spells and effects by the same amount. for each of those three perks, so long as you have them. If you don't have them yet, then you read far too much of this page.